Koi suffering from the carp pox virus, with symptoms displaying as white waxy swelling of the caudal fin. Source: (2011) AACL Bioflux. 4. (4). Carp pox, or koi pox, is an inherited gene passed down through ornamental koi and wild carp which causes outbreaks of the herpes virus Cyprinid Herpesvirus 1, or “CyHV-1”. Although contagious between fish, the virus initially lays dormant within carriers of the herpes gene and usually erupts during periods of stress, lower immune activity (hibernation/topor), or when koi are still young and developing. The virus is omnipresent in fish born with the carrier gene, and will be with them throughout their life in varying degrees of severity. Luckily, unlike the highly deadly herpes viruses CyHV-2 and CyHV-3, the inherited CyHV-1 herpesvirus is not dangerous and fish usually outgrow their symptoms as their immune system matures. Symptoms of the common CyHV-1 virus are mostly cosmetic in nature, causing slight disfigurement and swelling of fins and scales which usually disappear as the virus is reduced by the immune response. As a kois immune system matures with age, less and less virus activity takes place, and this is why some koi keepers state their fish “outgrow” the virus after reaching full adult maturity. What does Koi Pox look like? Is Pox Dangerous? Lesions from common carp pox display as white or pink waxy spots on scales and fins. Source: (2011) AACL Bioflux. 4. (4). The common herpes virus, CyHV-1, often presents as white or pink waxy spots, commonly on the fins or head of the fish, and looks similar to candle wax in appearance (see koi pox pictures). These semi-translucent lumps may look unsightly, but they’re typically harmless and do not need any direct treatment. These waxy spots are the single most common symptom of the CyHV-1 herpes virus, and if you notice them on your fish, you can safely assume you have the common carp pox virus and not the deadly sub-type varieties. As with any infection, fish may also become stressed during periods of herpes outbreak, so will be less likely to take food, may swim alone, or prefer hiding away under plants or shelters – all of which are normal as koi try to recover. The two dangerous herpes virus sub-types, CyHV-2 and CyHV-3 (KHV), attack the blood producing internal organs of the fish, including the kidneys, liver, and spleen. The mortality rate of these sub-types is as high as 90%, and displays as red sores and lesions over the body of the fish, creating a rash-like appearance. There is no cure for any type of carp pox, but luckily the deadly sub-types are very rare, and in almost all cases your koi will display white/pink spots which are almost definitive signs of the non-deadly herpes virus, CyHV-1. 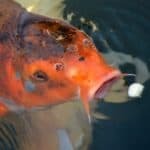 What Causes Carp Pox in Ornamental Koi? The pox virus will always be present in fish who carry the herpes gene, but it can still be spread to other fish during an outbreak. Carp pox is one of the oldest recorded carp diseases, and occurs from an inherited gene which allows the herpes virus to become active in fish. Many ornamental koi will have the herpes gene at birth, and symptoms will come and go as the fish matures with age. Even though the common virus is very similar to the rare CyHV-2 and CyHV-3 sub-types, a carrier of CyHV-1 carp pox cannot transmit or become a carrier of the more dangerous types. This is because although each of the herpes viruses are similar, they’re still different viral species and cannot mutate into other forms. The only way for fish to contract one of the deadly herpes virus types is to come into contact with a fish who is already infected with the disease (very rare). Sadly, there is no cure for carp pox, so the fish rely on their natural immune system for support and control of the virus. During summer where water temperature is much higher, a fishes immune system will be in full-swing, capable of destroying new virion particles before they can find a new host cell to spread the disease. In winter, however, when water temperature is lower, a fishes immune system will be reduced, and it is during these periods that outbreaks of the virus occur more heavily. Why Can’t Carp Pox be Cured? What about Medicine? Carp pox is caused by the herpes virus, and unlike bacteria, viruses are notoriously difficult to cure. Unlike bacterium which are fairly complex micro-organisms, viruses are incredibly simple in comparison, and it’s their simplicity that makes them so difficult to eradicate. Even though the processes that occur within human cells are similar to bacteria cells, the molecular machines that drive these functions are still quite distinct. Likewise, a bacteria will have a cell membrane that is chemically distinct from its human counterpart, which means we can target these differences to help destroy the bacteria without destroying healthy cells – such as with antibiotics. Viruses, on the other hand, are much more simple and do not require such complicated processes to survive and replicate. Whereas a bacteria will have their own distinct metabolism to create proteins for survival, a virus will instead hi-jack a healthy cell which it will use to carry out this function for them. Viruses will have just enough resources available to find and hi-jack a healthy cell, and from there they start to fully rely on the host cell for their survival and reproduction. This is why it’s so difficult to cure the herpes virus in koi, as once the virus has found healthy cells to infect, it becomes impossible to destroy without also destroying the cells as a whole, which would in turn kill the fish as a result. However, to replicate, the virus will need to continually release virion particles which work to seek out new cells to hi-jack. During this period the particles are vulnerable, and the immune system can recognize and destroy them before they find a healthy cell. During summer and warmer weather pox outbreaks are less common as the immune system is working at full capacity, making it difficult for the virus to find new cells fast enough to cause problems. It is essentially kept in balance, and eventually will go into a dormant period until the immune system is reduced, such as during hibernation or periods of heightened stress. Basically, instead of fighting pox with medicine, we need to fight it by ensuring our koi are healthy, strong, and have a good immune response in case of trouble. Note: The virus that causes carp pox cannot be cured, but there are methods to help improve symptoms and reduce the chance of outbreaks in future. Below we have listed some steps which can help alleviate symptoms and encourage a stronger immune response. When? Late autumn and early spring, or during onset of carp pox symptoms to prevent any possible parasitical infection. The herpesvirus that causes carp pox likes to “wake up” when a kois immune system goes to sleep, and so does another threat which can lead to worsening pox or a reduction in immune activity – we’re talking about parasites! Just like koi pox, parasites often strike during times when koi are more vulnerable to infection, such as during their winter hibernation period. Parasites that infect carp will not only cause stress and injury (open sores), but will also greatly reduce their immune system as koi struggle to work against the problem. Basically, if you have koi, you should make a habit of treating for parasites as part of your winter and spring fish keeping routine! Treating the pond in late-fall and early spring is a good way to reduce the risk of parasites, and ensure if koi do get a pox outbreak, there is much less chance of it spreading or worsening due to stress. Our recommended parasite treatment is always Aqua Prazi, which contains the broad spectrum parasite killer praziquantel. This compouind works on a huge range of internal and external parasites, being particularly effective against skin and gill flukes which are some of the worse species in combination with carp pox. Due to how contagious and fast spreading parasites can be, it’s recommended to treat the entire pond system, but it can also be used in quarantine if only a single fish is presenting symptoms. When dosed properly, the treatment should have no ill effects on water quality or the eco-system. A single dose should be added to the pond over a week period, and then repeated after 2-4 weeks to combat any hatching eggs or larvae. When? At first signs of carp pox symptoms, preferably within a quarantine environment. Will reduce risk of bacterial infection occurring if lesion is ruptured. Although it cannot cure the waxy spots that occur during a carp pox outbreak, treating the pond with a natural anti-bacterial treatment will help ensure any damaged lesions do not become infected. Melafix contains naturally occurring anti-bacterial ingredients (botanical tea tree), as well as ingredients to help speed up the recovery process. Designed for wounds, sores, and injuries, it can still be used as a good deterrent method during a pox outbreak to keep harmful pathogens from infecting areas with swelling. The treatment can be applied directly to the entire pond system, or the fish can be treated individually in a separate quarantine environment. Due to most of the ingredients being natural, and since it contains no chemical bactericides, it should have little negative effects on the eco-system if dosed correctly. However, the main ingredient is still a bacterium inhibitor, so it should not be used alongside beneficial bacteria supplements or KoiZyme (step 3), as it will reduce their effectiveness. The treatment can be used daily for a week when there is a carp pox outbreak to speed recovery and sharply reduce harmful bacteria levels. Afterwards, we recommend using KoiZyme (below) as a long term method of safe harmful bacterium control. When? After carp pox symptoms have improved and other treatments finished. Helps reduce harmful ulcer causing bacteria in ponds over time. As mentioned above, harmful bacteria which naturally lives in the pond can cause issues for fish with pox due to the external nature of the symptoms. Some of the most dangerous bacteria strains are the aeromonas and pseudomonas bacterium, which are a leading cause of ulceration and infection in pond fish. Both these bacteria strains live naturally in all bodies of fresh water, and they do not usually cause problems unless their numbers begin to rise too high. An interesting and very effective method of controlling these harmful bacteria strains is by using KoiZyme, which is a mix of both natural enzymes and harmless bacteria strains. The harmless bacteria KoiZyme introduces is able to reproduce much faster than the aeromonas and pseudomonas bacterium, which leads to a sharp reduction in their numbers over time. Although this can’t remove 100% of the harmful strains, it will help ensure that any possible infections or ulcers in future will be much less serve as there is less harmful bacteria in the environment to present problems. After carp pox is under control and after anti-bacterial treatments are finished, you can supplement the pond with KoiZyne once a day, every 3 days to kick-start the new treatment. Afterwards, weekly dosing should be enough to ensure harmful bacteria cannot rise to dangerous levels. When? If your koi are young or prone to have frequent outbreaks of carp pox. Can be used standalone throughout the year, or mixed into normal feed. There is no cure for carp pox, so the first and last line of defence against the virus is your kois natural immune system! Ensuring koi are healthy, comfortable, and happy in their environment is key element of fish keeping, and feeding with a high quality fish food is a cornerstone of any koi keepers routine. Not only will a high quality feed ensure your koi stay healthy and grow strong, it will also keep their immune system firing so they can combat any pathogens they come in contact with. The herpesvirus can only be controlled when the immune system of the fish is faster to act than the virus can spread, and can be given a “boost” with feeds that contain immune boosting ingredients. Commonly found immune boosters include, Optimun, Aquagen, Torula Yeast, Bee Propolis, Lactoferrin, and many others. These natural and synthetic compounds have all been shown to improve the immune system in koi, and would be a good addition to your feeding routine during carp pox outbreaks. Optimun, found in Total Kois Show Koi range, is a powerful performance enhancer designed for heightened immune response, and is one of our favorite feeds for boosting the immune system. It contains a high protein content from aquatic source (anchovery meal 38%), as well as healthy fats, low ash content, and a wide range vitamin and mineral profile. A very solid choice of immune boosting feed to mix into your regular feed or as a replacement feed during periods of carp pox! When? Throughout colder months to keep immune system more active, or during an outbreak in quarantine tank to speed up recovery. Finally, another aspect to consider which is directly related to the frequency of carp pox outbreaks is the temperature of the surrounding water. The herpesvirus almost always springs up in the winter when koi are in topor, as their immune system is all but shut down due to the cold water temperature. Fish pox is much rarer in summer, as a fish will have a much higher metabolism to process energy, and in turn, a much more active immune response to destroy spreading virus particles. Although you can’t stop winter from coming, you could instead invest in a powerful in-line heater system or an immersed heater which will help raise water temperatures and increase immune activity over the winter period. In-line heaters work by directly heating surrounding water which passes through a heating chamber via a dedicated pump from your pond. The warmer water is then added back to the pond system, and gradually the overall temperature increases and can be maintained with a thermostat. If you have a smaller pond, around 500~ gallons, both a high rated immersed heater or powerful de-icer is capable of raising temperatures in the surrounding water enough to improve immune activity. For larger ponds, or if you have bitterly cold winters, the only solution would be a powerful water heater, similar to the heaters you see used for warming large swimming pools. Even though most heaters will only be able to raise water temperatures by a few degrees, this is often enough to maintain much higher immune activity and will help keep winter pox outbreaks at bay. Alternatively, and if you only have a small number of koi (or young fish), they can be brought indoors and added to a large holding tank during winter. With this method a heater may not even be necessary if you can maintain a higher atmospheric temperature, as water will eventually warm naturally in-line with the surrounding conditions. Can Prazi and Melafix be used together or is it best to do 1 at a time? A few of our Koi have Carp Pox and we are seeking some sort of treatment. Both Aqua Prazi and Melafix are fairly “inert” treatments, and I don’t think you’d have problems dosing both assuming your water quality is in good order. However, as with any chemicals you add to the pond, they will still place stress on the eco-system (and fish) to some extent, so it’s always beneficial to treat in stages if you’re able. If your koi are just showing signs of pox, and have no visible sores/wounds, I personally would treat with Aqua Prazi first, wait 3 days, perform a 10-20% water change, then dose the pond with Melafix. Afterwards, keep a close eye on their behaviour and appearance, and simply try to make them as comfortable as possible as stress is a major contributor to pox outbreaks, especially in young/weak fish. I hope your koi feel better soon! I have a big yellow koi that is sick. It looks like he has cloudy eye but also has white patches on his body. He is swimming in real abnormal ways. The water is about 15 degrees. He was fine and hibernating at the bottom of the pond just a couple days ago. Anyway to diagnose and how to treat whatever is going on? I’m sorry to hear about your koi and their symptoms! You’ve done the right thing treating for parasites, as they have the potential to cause major issues with weakened koi, so it’s always better to be on the safe side. From your description, it sounds like your fish are fighting the virus well and they’re fairly healthy overall (no broken welts, bleeding etc.). Sadly, there is little more that can be done now apart from making your fish as comfortable as possible. Adding KoiZyme to the water can help reduce the more harmful bacteria strains that can cause further issues during pox outbreaks. Supplementing with a high quality feed (which should always be done, anyway! ), such as the food in this article, can give your fish more energy to fight back. Heating the pond, even by a few degrees or creating a “warm pocket” with an immersion heater, can help increase the immune activity and metabolism of your fish, which is usually very low this time of year. These are all things you can try, but sometimes, you just need to let the virus run it’s course! If your koi are looking healthy, and there are no secondary problems/infections, just keep them comfortable and they should be able to ride it out. Ps- I’ve updated the article so the links to products now show as in-stock, so you’re welcome to have another look! thanks for the blog post! I think my goldfish was a carrier. A pet sitter overfed him, the nitrates spiked, and when I got home his fins were in tatters. Shortly thereafter he broke out in the white bumps, which have gotten worse. Otherwise he acts healthy. Has anyone removed these? Can I add new fish? He’s alone with an old catfish right now. He has a page on my old blog. I’m very sorry to hear about what happened to your fish. I’ve just checked the images on your blog and yes, that does look like a particularly nasty outbreak. Your fish must have been under high stress for it to progress so quickly and severely. I really do hope your last goldfish recovers! When it comes to carp pox, so long as fish are acting somewhat normal, just keeping them as comfortable as possible is often the best long-term solution. The swelling usually disappears in time, but can take several months if the fish is in bad shape as the immune system needs time to catch up. Physically removing lesions is never a good idea (unless recommended and handled by a trained veterinarian), as it would just open the door to potential secondary infections and even more stress. Since in your case it sounds like spikes in harmful substances were the primary trigger, a good way forward would be simply doing all you can to keep water quality in good order and the environment stress-free. More regular water changes to reduce nitrogen compounds, a high quality fish feed, and maybe even raising the water temperature a degree or two for a few weeks to help increase immune activity and metabolism. In terms of adding fish, and assuming this is in-fact carp pox, only other cyprinids (carps and minnows) can contract the virus. If you’d want to add more goldfish, there would always be a risk of outbreaks and further spread – as well as the new fish themselves being carriers! In most cases, carp pox is not dangerous and you often don’t even notice the symptoms. In-fact, if an adult fish is happy and healthy, I’d be surprised if the virus ever manages to surface to any noticeable degree. In other words, you shouldn’t worry about how you might cure this problem (it’s not possible! ), but instead, how you can best manage it so it doesn’t appear in the first place. I have a koi with carp pox but is in a tank with two other koi. does that make the other two carriers? I have 9 koi in a different pond so have kept them separated. I don’t want to infect my other koi. should I keep them separated or will my other koi get carp pox also? That would be almost impossible to know for sure, but if all the fish are offspring of the same parent, they likely do have a higher chance of being carriers. However, just remember, carp pox is very common in the hobby, but when managed properly, it’s really nothing to worry about. In-fact, I’d wager most koi keepers have fish which are carriers, but they never notice as they keep the koi healthy and in good conditions which stops the virus flaring up. Carp pox is one of those things which you really can’t avoid (or cure), so it’s better to just manage it as best you can. Whether your other koi contract the virus in future, I have no idea and really couldn’t predict that. But if you keep them all happy, healthy, and in good condition through their lives, even if they have it, you may not even notice!